I made the 2nd bag “Bran” in stead of “Oats” and a different colour label to help tell the bags apart so it’s hopefully even more clear that it’s a different bag. 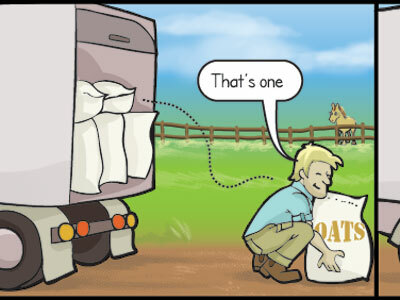 Also I think the speech bubbles help show he’s unloading, not loading the truck. The pony was a bit hard to draw so far away. If I was to re-do this one I might make the pony closer. I think it is still identifiable as a pony. I love drawing and horseriding.